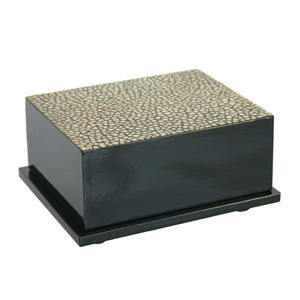 Thailand’s lacquerware artisans present this beautiful soap box. 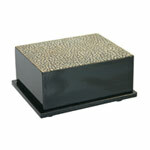 The loose eggshell mosaic decorating the lid highly contrasts with the black lacquer finish. Size: 13.5 cm W x 6.5 cm H x 11.0 cm D.
Materials: Eggshell on lacquered plywood. This lacquered center piece is handcrafted by artisans in a small workshop located in Chiang Mai, Thailand.